Abdul Rashid Dostum (/ˈɑːbdəl rəˈʃiːd doʊsˈtuːm/ ( listen) AHB-dəl rə-SHEED dohs-TOOM; Dari: عبدالرشید دوستم‎, Uzbek Latin: Abdul Rashid Do‘stum, Uzbek Cyrillic: Абдул Рашид Дўстум; born March 25 1954) is an Afghan politician and general in the Afghan National Army who has served as Vice President of Afghanistan since 2014. An ethnic Uzbek, he is a former communist general and warlord known for siding with winners during different wars in Afghanistan. He is the founder of the political party Junbish-e Milli (National Islamic Movement of Afghanistan). During the Soviet–Afghan War in the 1980s, Dostum was part of the Afghan National Army and the regional commander of the country's north, commanding about 20,000 mostly Uzbek soldiers participating in battles against mujahideen rebels. In 1992, he deserted the Mohammad Najibullah government shortly before its collapse, joining the mujahideen, forming his Junbish-e Milli party and militia and becoming an independent warlord. He subsequently became the de facto leader of Afghanistan's Uzbek community, controlling the country's northern provinces and Mazar-i-Sharif, effectively creating his own proto-state with an army of up to 40,000 men with tanks supplied by Uzbekistan and Russia and jets. He initially supported the new government of Burhanuddin Rabbani in Kabul but in 1994 switched sides and allied with Gulbuddin Hekmatyar. In 1995, he switched sides again and backed Rabbani. In 1997, he was forced to flee after his former aide Abdul Malik Pahlawan took Mazar-i-Sharif, before he fought back and regained control. In 1998, the city was overrun by the Taliban and he fled again. 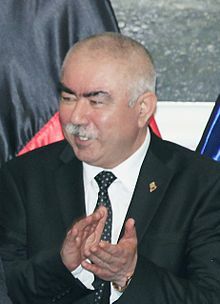 Dostum returned to Afghanistan in 2001 and joined the Northern Alliance after the US invasion, leading his faction in the Fall of Mazar-i-Sharif. After the fall of the Taliban, he joined Hamid Karzai's presidential administration but spent most of his time in Turkey. He also served as Chairman Joint Chiefs of Staff of the Afghan Army, a role often viewed as ceremonial. From 2011, he was part of the leadership council of the National Front of Afghanistan along with Ahmad Zia Massoud and Mohammad Mohaqiq. In 2014, he joined Ashraf Ghani's presidential administration as a vice president, but was forced to flee again in 2017 after being accused of sexually assaulting a political rival. In 2018, he narrowly escaped a suicide bombing by ISIL-KP as he returned to Afghanistan at Kabul airport. In 2019, he escaped an hours-long attack by the Taliban on a convoy he was travelling in. Dostum was born in 1954 in Khwaja Du Koh near Sheberghan in Jowzjan Province, Afghanistan. Coming from an impoverished Uzbek family, he received a very basic traditional education as he was forced to drop out of school at a young age. From there, he took up work in the village's major gas fields. Dostum began working in 1970 in a state-owned gas refinery in Sheberghan, participating in union politics, as the new government started to arm the staff of the workers in the oil and gas refineries. The reason for this was to create "groups for the defense of the revolution". Because of the new communist ideas entering Afghanistan in the 1970s, he enlisted in the Afghan National Army in 1978. Dostum received his basic military training in Jalalabad. His squadron was deployed in the rural areas around Sheberghan, under the auspices of the Ministry of National Security. By the mid-1980s, he commanded around 20,000 militia men and controlled the northern provinces of Afghanistan. While the unit recruited throughout Jowzjan and had a relatively broad base, many of its early troops and commanders came from Dostum's home village. He left the army after the purge of Parchamites, but returned after the Soviet occupation began. During the Soviet–Afghan War, Dostum was commanding a militia battalion to fight and rout mujahideen forces; he had been appointed an officer due to prior military experience. This eventually became a regiment and later became incorporated into the defense forces as the 53rd Infantry Division. Dostum and his new division reported directly to President Mohammad Najibullah. Later on he became the commander of the military unit 374 in Jowzjan. He defended the Soviet-backed Afghan government against the mujahideen forces throughout the 1980s. While he was only a regional commander, he had largely raised his forces by himself. The Jowzjani militia Dostum controlled was one of the few in the country which was able to be deployed outside its own region. They were deployed in Kandahar in 1988 when Soviet forces were withdrawing from Afghanistan. Due to his efforts in the army, Dostum was awarded the title "Hero of the Republic of Afghanistan" by President Najibullah. Dostum's men would become an important force in the fall of Kabul in 1992. In April 1992, the opposition forces began their march to Kabul against the government of Najibullah. Dostum had allied himself with the opposition commanders Ahmad Shah Massoud and Sayed Jafar Naderi, the head of the Isma'ili community, and together they captured the capital city. He and Massoud fought in a coalition against Gulbuddin Hekmatyar. Massoud and Dostum's forces joined together to defend Kabul against Hekmatyar. Some 4000-5000 of his troops, units of his Sheberghan-based 53rd Division and Balkh-based Guards Division, garrisoning Bala Hissar fort, Maranjan Hill, and Khwaja Rawash Airport, where they stopped Najibullah from entering to flee. Dostum then left Kabul for his northern stronghold Mazar-i-Sharif, where he ruled, in effect, an independent region (or 'proto-state'), often referred as the Northern Autonomous Zone. He printed his own Afghan currency, ran a small airline named Balkh Air, and formed relations with countries like Uzbekistan. While the rest of the country was in chaos, his region remained prosperous and functional, and it won him the support from people of all ethnic groups. Many people fled to his territory to escape the violence and fundamentalism imposed by the Taliban later on. In 1994, Dostum allied himself with Gulbuddin Hekmatyar against the government of Burhanuddin Rabbani and Ahmad Shah Massoud, but in 1995 sided with the government again. Following the rise of the Taliban and their capture of Kabul, Dostum aligned himself with the Northern Alliance (United Front) against the Taliban. The Northern Alliance was assembled in late 1996 by Dostum, Massoud and Karim Khalili against the Taliban. At this point he is said to have had a force of some 50,000 men supported by both aircraft and tanks. Much like other Northern Alliance leaders, Dostum also faced infighting within his group and was later forced to surrender his power to General Abdul Malik Pahlawan. Malik entered into secret negotiations with the Taliban, who promised to respect his authority over much of northern Afghanistan, in exchange for the apprehension of Ismail Khan, one of their enemies. Accordingly, on 25 May 1997, Malik arrested Khan, handed him over and let the Taliban enter Mazar-e-Sharif, giving them control over most of northern Afghanistan. Because of this, Dostum was forced to flee to Turkey. However, Malik soon realized that the Taliban were not sincere with their promises as he saw his men being disarmed. He then rejoined the Northern Alliance, and turned against his erstwhile allies, driving them from Mazar-e-Sharif. In October 1997, Dostum returned from exile and retook charge. After Dostum briefly regained control of Mazar-e-Sharif, the Taliban returned in 1998 and he again fled to Turkey. Dostum returned to Afghanistan in May 2001 to open up an new front before the U.S.-led campaign against the Taliban joined him, along with Commander Massoud, Ismail Khan and Mohammad Mohaqiq. In November 2001, with the beginning of the U.S. invasion of Afghanistan, and against the wishes of the CIA who distrusted Dostum, a team including Johnny Micheal Spann landed to set up communications in Dar-e-Suf. A few hours later 12 men of Operational Detachment Alpha (ODA) 595 landed to begin the war. On 24 November 2001, 15,000 Taliban soldiers surrendered after the Siege of Kunduz to American and Northern Alliance forces. The Taliban laid down their weapons a few miles from the city of Mazar-i-Sharif, and eventually surrendered to Dostum. A small group of armed foreign fighters were transferred to the 19th century garrison fortress, Qala-i-Jangi. The Taliban used concealed weapons to start the Battle of Qala-i-Jangi against the guards. The uprising was eventually brought under control. General Dostum has been accused by Western journalists of responsibility for the suffocating or otherwise killing of 2,000 Taliban prisoners in December 2001. Dostum denied the accusations in 2009. US President Obama in 2009 ordered an investigation into the matter, which as yet has yielded no (published) results. Dostum served as deputy defense minister the early period of the Karzai administration. On 20 May 2003, Dostum narrowly escaped an assassination attempt. He was often residing outside Afghanistan, mainly in Turkey. In February 2008, he was suspended after the apparent kidnapping and torture of a political rival. Some media reports in 2008 stated earlier that Dostum was "seeking political asylum" in Turkey while others said he was exiled. One Turkish media outlet said Dostum was visiting after flying there with then Turkey's Foreign Minister Ali Babacan during a meeting of the Organization for Security and Cooperation in Europe (OSCE). On 16 August 2009, Dostum was asked to return from exile to Afghanistan to support President Hamid Karzai in his bid for re-election. He later flew by helicopter to his northern stronghold of Sheberghan, where he was greeted by thousands of his supporters in the local stadium. He subsequently made overtures to the United States, promising he could "destroy the Taliban and al Qaeda" if supported by the U.S., saying that "the U.S. needs strong friends like Dostum." On 7 October 2013, the day after filing his nomination for the 2014 general elections as running mate of Ashraf Ghani, Dostum issued a press statement that some news media were willing to welcome as "apologies": "Many mistakes were made during the civil war (…) It is time we apologize to the Afghan people who were sacrificed due to our negative policies (…) I apologize to the people who suffered from the violence and civil war (…)". Dostum was directly chosen as First Vice President of Afghanistan in the April–June 2014 Afghan presidential election, next to Ashraf Ghani as President and Sarwar Danish as second Vice President. In July 2016, Human Rights Watch accused Abdul Rashid Dostum's National Islamic Movement of Afghanistan of killing, abusing and looting civilians in the northern Faryab Province during June. Militia forces loyal to Dostum stated that the civilians they targeted – at least 13 killed and 32 wounded – were supporters of the Taliban. In November 2016, at a sporting event, he punched his political rival Ahmad Ischi, and then his bodyguards beat Ischi. In 2017, he was accused of having Ischi kidnapped in that incident and raped with a gun on camera during a five-day detention, claims that Dostum denies but that nevertheless forced him into exile in Turkey. On 26 July 2018, he narrowly escaped a suicide bombing by ISIL-KP as he returned to Afghanistan at Kabul airport. Just after Dostum's convoy departed the airport, an attacker armed with a suicide vest bombed a crowd of several hundred people celebrating his return at the entrance to the airport. The attack killed 14 and injured 50, including civilians and armed security. On 30 March 2019, Dostum again escaped an expected assassination attempt while traveling from Mazar-e-Sharif to Jawzjan Province, though two of his bodyguards were killed. The Taliban claimed responsibility for the attack, the second in eight months. Dostum is considered to be liberal and somewhat leftist. Being ethnic Uzbek, he has worked on the battlefield with leaders from all other major ethnic groups, Hazaras, Pashtuns and Tajiks. When Dostum was ruling his northern Afghanistan proto-state before the Taliban took over in 1998, women were able to go about unveiled, girls were allowed to go to school and study at the University of Balkh, cinemas showed Indian films, music played on television, and Russian vodka and German beer were openly available – activities which were all banned by the Taliban. He viewed the ISAF forces attempt to crush the Taliban as ineffective and has gone on record saying in 2007 that he could mop up the Taliban "in six months" if allowed to raise a 10,000 strong army of Afghan veterans. Senior Afghan government officials do not trust Dostum as they are concerned that he might be secretly rearming his forces. Navid Negahban portrays Dostum in the 2018 film 12 Strong. Dostum appears as a playing card in the board game A Distant Plain. ^ Partlow, Joshua (23 April 2014). "He was America's man in Afghanistan. Then things went sour. Now Abdurrashid Dostum may be back". The Washington Post. Retrieved 4 January 2018. ^ "Rashid Dostum: The treacherous general". Independent.co.uk. 1 December 2001. Retrieved 4 January 2018. ^ a b c d David Pugliese (10 May 2007). "Former Afghan warlord says he can defeat Taliban". CanWest News Service. Archived from the original on 21 May 2008. Retrieved 22 April 2008. ^ a b "Afghan Vice President Dostum Escapes Suicide Attack; 14 Others Killed". RadioFreeEurope/RadioLiberty. Retrieved 21 October 2018. ^ a b Sahak, Abdul Matin. "Afghan vice president narrowly escapes death for a second time". Reuters. Retrieved 30 March 2019. ^ a b "Abdul Rashid Dostum". Global Security. Archived from the original on 1 March 2009. Retrieved 18 March 2009. ^ a b "Profile: General Rashid Dostum". BBC News. 25 September 2001. Archived from the original on 8 April 2009. Retrieved 18 March 2009. ^ a b c d e "Abdul Rashid Dostum". Islamic Republic of Afghanistan. Archived from the original on 10 March 2009. Retrieved 18 March 2009. ^ Vogelsang (2002), p. 324. ^ Vogelsang (2002), p. 232. ^ Johnson, Thomas H. "Ismail Khan, Herat, and Iranian Influence". Center for Contemporary Conflict. Archived from the original on 11 August 2004. Retrieved 20 March 2007. ^ page 6-8 - Nate Hardcastle. American Soldier: Stories of Special Forces from Grenada to Afghanistan (2002 ed.). Thunder's Mouth Press. p. 364. ISBN 1-56025-438-6. ^ UN Security Council report. "La situation en Afghanistan et ses conséquences pour la paix et la sécurité internationales". Human Rights Internet. Archived from the original on 30 September 2007. Retrieved 20 March 2007. ^ Robert Young Pelton (2007). "The Legend of Heavy D & the Boys:In the Field With an Afghan Warlord". National Geographic Society. Archived from the original on 6 April 2008. Retrieved 22 April 2008. ^ "ODA 595". PBS. 2007. Archived from the original on 29 April 2008. Retrieved 22 April 2008. ^ "Dostum, Abdul Rashid". Afghan Biographies. Retrieved 16 January 2017. ^ Wafa, Abdul Waheed. "Afghan police lay siege to home of former warlord". Retrieved 21 October 2018. ^ "The Times & The Sunday Times". TheTimes.co.uk. Retrieved 4 January 2018. ^ Motlagh, Jason; Carter, Sara A. (22 September 2009). "Afghan warlords will fight if U.S. gives weapons". Washington Times. Retrieved 23 September 2009. ^ Bezhan, Frud (8 October 2013). "Former Afghan Warlord Apologizes For Past 'Mistakes'". Radio Free Europe/Radio Liberty. ^ a b "Taliban kills 24 police in two days". The Australian. 1 August 2016. ^ "Afghan VP 'punches, kidnaps' rival at traditional sporting event". The New Arab. 28 November 2016. Retrieved 18 May 2018. ^ Mashal, Mujib; Rahim, Najim (18 July 2017). "Afghan Vice President's Return Thwarted as Plane Is Turned Back". Retrieved 4 January 2018 – via NYTimes.com. ^ Williams, Brian Glyn (6 July 2016). "The State Department Insults the Afghan Vice President (And All Afghan Uzbeks)". HuffingtonPost.com. Retrieved 4 January 2018. ^ Vogelsang (2002) p. 232. ^ Kroll, Justin (17 November 2016). "Chris Hemsworth's Afghanistan War Drama 'Horse Soldiers' Adds 'Homeland's' Navid Negahban". Variety. Retrieved 16 January 2018. ^ Train, Brian; Ruhnke, Volko (2013). "«A Distant Plain: Insurgency in Afghanistan» Playbook" (PDF). GMT Games. p. 38. Retrieved 12 July 2018. Vogelsang, Willem. (2002). The Afghans. Blackwell Publishers, Oxford. ISBN 0-631-19841-5. Obama Calls for Probe into 2001 Massacre of Suspected Taliban POWs by US-Backed Afghan Warlord – video by Democracy Now! 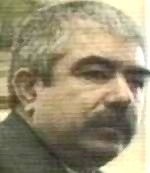 Wikimedia Commons has media related to Abdul Rashid Dostum.